As I've pursued making my photography a career, you encounter all kinds of people. From the clients who "no-show" to the absolutely gorgeous or handsome individuals who insist that they're working on some arbitrary goal before they can be photograph ready! No matter what the excuse is I'm always of the same belief that no matter who or where you are, you are in a position to be worthy of a photograph. One of the defining things that make us who we are is our memories. Happy, sad, angry, or even just frustrated. We hold onto these emotions and the stories behind them, reliving and holding onto them in our heads and in our conversations. But as we age onwards, our thoughts and our memories fade. Crucial details begin to slip. Some memories are forgotten altogether. With photographs, and especially of physical printed artwork it helps us remember. Everyone of us has had our darker moments and everyone of us has had our happier moments. Try as we might we strive to remember only the happy. But as you and I begrudgingly can admit, the happy memories are not the only ones that persist. To those who say that now is not a memory that they want, or to those who say I am not in a memory ready condition, I offer to you this challenge. Look for the good in your situation and embrace who you are. Whether you are working to recover from the biggest downfall in your life or you are working towards reaching your biggest goal... Stop. Stop and bask in this moment and realize it as an integral part of your life. The boring day to day stuff often bears little on our memories. But when you begin to say that right now is not the moment, now is not the right memory, challenge yourself on why it's not the right moment or memory. Here's a story. Back when I was a younger boy, I grew up constantly being threatened with adoption, being kicked out onto the street, and many other forms of "We don't want you". As a result of my upbringing, those lessons have affected everything I've done or believed about myself. Even as an adult on my own, the memories of "we don't want you" permeates into my self talk and beliefs. But if you were to ask me if I wanted to remember right now? I would answer yes. Because even as we struggle with our demons and skeletons, as we push on our upwards battle, I can stop and look at myself. I can see all of my memories. And I can photograph them and capture them so that I do not forget where I've come from. The true sign of success in a person is growth from who we were yesterday. But as people, we deserve the right to love and remember ourselves every step of the way. Even if you make mistakes. Even if you were raised to believe you were nothing; haven't began to reach your goals. Maybe you haven't even haven't started on your goal! The truth is at the end of the day. We're all humans and we're all uniquely individual. No one in the universe has or will ever live life as you. Even if it's for your friends or your family, everyone is worth remembering. For the good. For the bad. For forever. Make memories that last. Cherish the ones you make. Yesterday I had a coffee with an amateur photographer. They had seen my work and was heavily interested in knowing what ticks in my head, what I see and what I focus in on when taking my photographs. As we progressed through talking over the basics, we meandered here and there before it came time to showcase our work. One question she asked stood out to me. "Where are the photos you're not proud of?" We had been discussing greatly what makes a photograph great, what makes one not so great, but as we're going through all of my works... there wasn't a single one that I wasn't proud of. Why is that? Well to start with, you need to cull down your photographs. You can either focus in on delivering a bunch of really average photographs OR you can focus in on delivering the absolutely best quality you can with fewer photographs. This mindset affects both my post processing and my actual shooting. When I'm at a photoshoot, I rarely end up taking more than 50-100 photos. When I'm culling through all my photographs, I really ask myself what photographs do I want to put out there? Which are the ones I'm absolutely proud to put my name to and shout out to the world that I took that photograph? When you start really focusing in on quality over quantity, your photography and your business improves. You're not presenting the client 1,000 photos, of which roughly 900 never deserve to be looked at again. You're not TAKING 1,000 photos. By keying in on delivering quality, you become more mentally involved in the whole process, raising the standards of yourself and your photos every day you continue to shoot. Do I still take bad photographs? Of course. It's only human to do so. But I'm still proud of those photos. They may never see the public's eye, but they're still key photos in which I realized those photographs do not meet the standards and levels of quality I hold myself to. Those photos make me strive to do better and make sure that every photo I deliver meets my standard. By focusing in on quality and delivering the best product ever, it also forces me to press my standards. Raise the bar, challenge myself. How do you approach your photography? Do you accept it as "meh" good enough? Or do you actively try and learn through every photo you take? I know what I do. But have you asked yourself what you're currently doing? Have you asked what you and your photography DESERVE for you to do? "Caution. High risk of theft, destruction of property, and attacks from wildlife. 4x4 is absolutely required. High clearance? Recovery Gear? Spare tire? Extra fuel/water?" This was my welcome to Big Bend National Park as we rolled in early Friday morning. 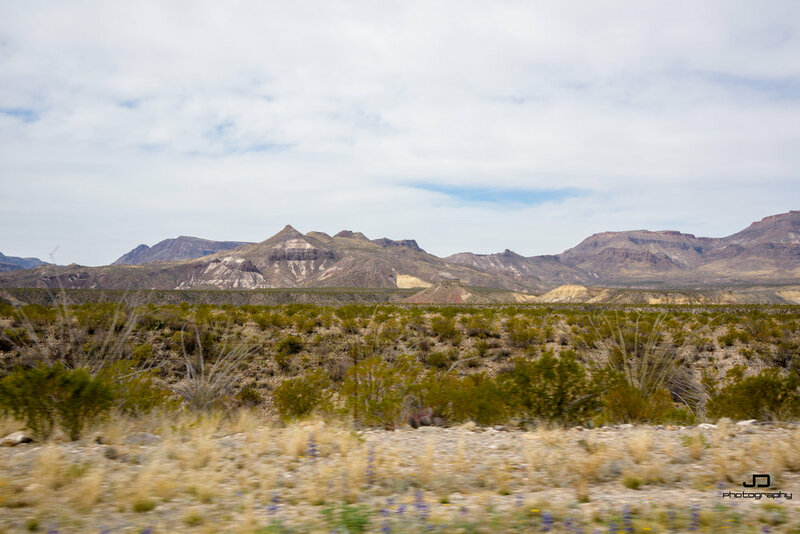 We'd powered through the night, sleeping intermittently, from San Antonio to Big Bend. We strolled on through to the visitor's center to begin figuring out the plans that would guide us through this weekend. But, as we would quickly find out... the park was almost booked out completely. Our choice was narrowed down to two possible camp sites. Some site off of Old Ore Road. Or Johnson's Ranch. We inquired about Johnson's Ranch and was quickly barraged with a list of warnings. Break ins, theft, destruction of property, bear sightings, mountain lions. The danger was apparent as the Ranger listed off her fire and brimstone repeatedly. I looked at the pictures they had of the site. The danger intrigued me, but the site... it made the decision for me. We booked out Johnson's Ranch and grabbed a copy of our papers and a map. The plan was simple. Explore as much of the off-road trails as we can, and set up camp and survive. As we told them of our plans, the Rangers made absolute sure that we knew how terrible the roads were. The washouts were abysmal, the conditions... terrible. Absolutely everything I was looking forward to. With the discovery that my dog was not allowed on the trails, and that with the wild life sightings... we couldn't leave her outside or inside of the truck, lest she become bear food. We headed on down and made our first turn taking us to Old Ore Road. The road conditions weren't too terrible, and we were able to quickly make work of it. We ran into a few drivers coming the other way, which after some awkward trail passes, we were able to glean some information from them. There was a couple in a Jeep whom I recall especially. When informed of our plans, they exclaimed that it was a terrible idea! The Rangers had informed them that the roads were closed, with wash outs feet wide. We simply smiled and told them that we had been told otherwise and were in for a challenge. They wished us luck and we continued on our way. The stakes were high. We were traveling in my truck. We had no cell service. We could handle getting stuck. But breaking something was out of the question. With this in mind, we pushed onwards. We traveled on through to the location I was most excited about. The stories and rumors of it were that it was perhaps the most challenging trail in any of the parks in the state. As we began to take the trail head, the dirt bikers in front of us turned off. Even they were not brazen enough to take Black Gap Road. We continued on. Very quickly we realized why it was so widely acclaimed. The main path of the trail took us through tight switchbacks, canyon trails with ledges a foot high. The sides of the trails? Drop offs. With the tight trails, my focus was 100% as we continued through the trails, our truck sometimes leaning to 20-25 degrees according to my dash. There were points where looking out my window felt like I was looking straight down into the canyon. 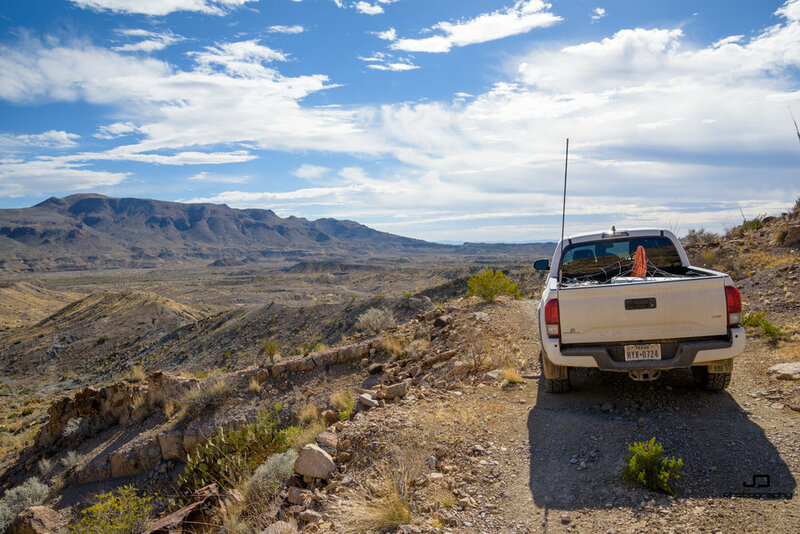 We advanced slowly, using our truck to it's full capability, we began conquering the switchbacks, the drop offs, the loose rocks, and the tight canyons. It was absolutely technical driving, yet with our upgrades to the truck, we managed to pass through with no damage, no scratches, and our skid plates remained virgin. Our excitement had for the day, we began our way down the eastern River road to get to our camp site. The couple in the Jeep had warned us that it was closed off, and it was apparent why. Each dry creek crossing was terrible. As we crawled through, our front and rear came within millimeters of touching. Through one stretch of desert running and a few others... confidence almost gave way to disaster. From powering through the desert, we found a series of ruts. We were tossed back and forth in a see sawing motion as our truck tried to survive the deep dips and sharp inclines of the washouts. Not once though did our truck falter. Toyota's engineering combined with the premium Icon stage 7 suspension absolutely ate every thing we threw at it while begging for more. During calmer stretches, sharp bumps led me to push my suspension. Hamming on the gas, I approached the inclines... not just once, but multiple times did we jump the truck and continue on without even coming close to pushing our limits. We rode within our limits, but it was apparent that the trucks limits still were beyond the toughest we threw at it. Eventually with all the fun and excitement done for the day, the real "danger" approached. We pulled into our campsite, just hundreds of feet away from the Rio, which the Ranger informed us a lot of the danger crossed from. Both animal and bipedal. We were the first to arrive between the two campsites. We sketched out the area, looking for signs of any wild life or human life. As we tried approaching the Rio, rustling in the brush separating us from the banks made us quickly turn tail. We set up, locked and loaded, but enjoying the calmness of an apparent "dangerous" area. Soon our future friends made their way down to their camp, and we quickly met each other and bonded over the apparent dangers we faced. Some quality HEB jalapeno poppers, drinks, and conversation were quickly passed through as a cold night began to led us back to our sleeping quarters. A few shots of the stars with everyone asleep, and I too would go to sleep. We awoke in the morning, safe and sound. Our camping area still secure, we began to pack up as we began for day two. 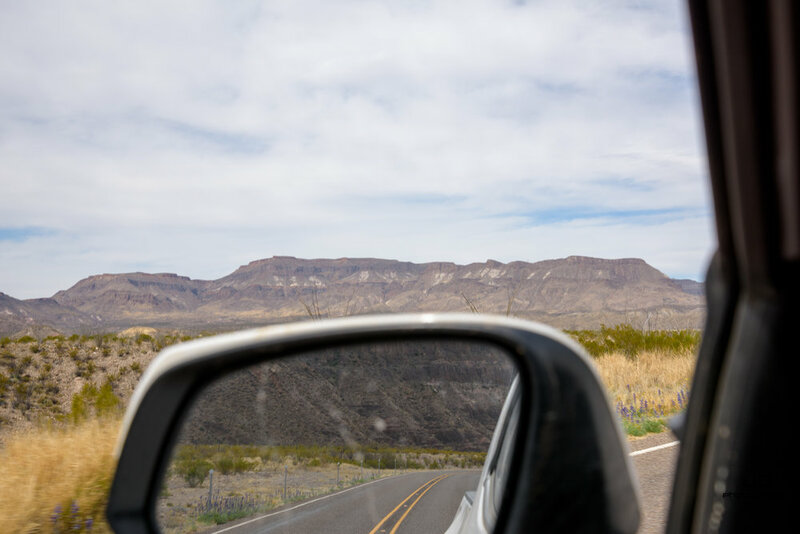 We would make our way west through the park to the Terlingua Ghost Town, and then on to the State Park. As we headed out we checked out the canyon overlook over the Rio Grande. A quick hike and we were in the Canyon, and the beauty of the area again made itself apparent. We hustled back to the truck where the dog was waiting, and we left out. An uneventful drive later, we continued basking in the neverending beauty of the area. The State park in my opinion was even more awe inspiring than the National Park. Multiple stops were made along the road, checking out view after view. Eventually we made our way further west out of the park and the mountain ranges begin to fade. 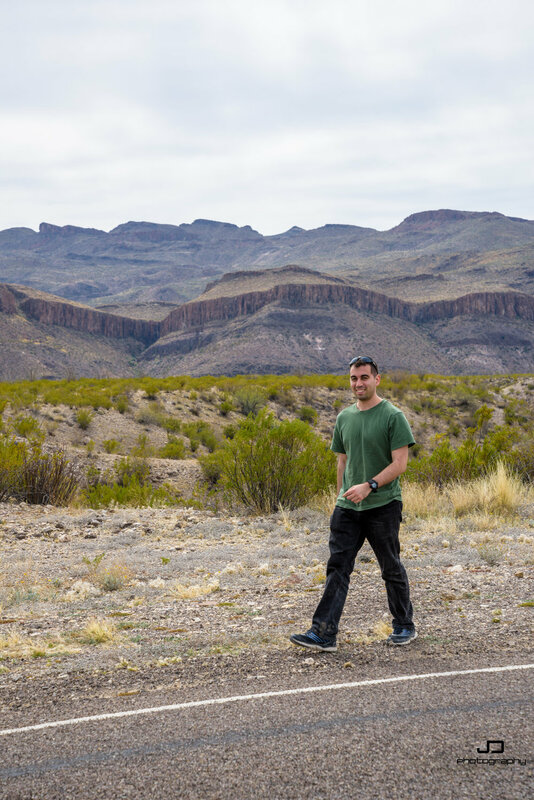 A quick stop in Presidio and Marfa for food and gas, and we began the long haul back to San Antonio. An absolutely amazing trip and it definitely blew away any other place I've ever been to. The pictures speak for themselves. The area is just absolutely remarkable. And this was my weekend, all thanks to a spontaneous decision to get outside made Thursday afternoon. A big thanks to Justin Renaud for the camaraderie and co-piloting skills. Definitely a great guy to go on spontaneous trips with. And as always, my dog is still the best road trip companion everrrrrrrr soooo. My dog > yours. Well last time I attempted to start my blog, I had some serious life issues come into play. My photography was set on the back burner and I was focusing on just making it through last year! Towards the end of 2016, things started coming back together and now we're set to push forward! There's been many photoshoots over the past few months and this excites me. While my initial project fell through due to issues between my model and I, I do have multiple things planned still for this year. I've redefined how I do business and am working to serve my clients from the beginning to the end of our exchanges, and am now offering quality prints to display in your homes! With 2017 starting off strong, I am confident that we can work to make an amazing year with even more amazing photographs and memories to come! Below you can see some of my favorite photographs from recent shoots and hopefully soon one of these photographs could be you! As a photographer, I've always wanted to be able to capture the moments in people's lives. To memorialize happiness and sadness, love, beauty, and connection. Too often are we able to get so wrapped up in life that we don't find a way to stop and capture what's going on around us. As an artist, I use my skills with photography to paint the picture that's told to me, capturing the emotion of my clients into the pictures. There exists a certain kind of madness that is created as I begin learning more about my subjects. Deep within my mind, it stirs away at how and where the best shots could be taken to capture their life and story in one photo. Recently, I elected to take on my first big project. I reached out to local San Antonio model and photographer groups looking for a model who could help me with this. Together between our experiences, I wanted to attempt to fabricate a story from scratch that will tell a story withgreat impact. For that, I picked a topic near and dear to me, suicide and depression. While I personally have struggled with these issues, I also have reached out and helped many others deal with it as well. Knowing too well the silent struggle that affects many Americans and others across the world, I sought to build a story that would connect viewers with the subject, my model, and help them understand more of the daily struggles. I met with my model at the Wonderland Mall of Americas in San Antonio, Texas. Her modeling agency's manager was there, and together the three of us discussed my idea. With a solemn fascination of creating a story that could connect and potentially reach out and help others, we elected to start the project immediately. Within a few days we had set a time and date, and with that we began our shoot. This project remains unfinished as of this post, but already I have strived to use every bit of my knowledge and talent to try and create the most beautiful, connective photos I can, drawing viewers into the stories, the characters, and more importantly, the issue being discussed. We worked hard, traveling all around the central Texas nearly exhausting our adventurous spirits as we struggled to find locations that would fit the theme. After a full days work of shooting and adventuring, we barely scratched the surface of our story. I as an artist and photographer, and as someone who struggles with depression, am wanting to take as long as it takes to fully nail down this project. I have to give a huge thanks to my model Evangelina Arredondo and to her boyfriend for volunteering to work with me on this project. We all have our own personal stories relating to suicide and depression, as well as many other people whom I know. I appreciate you all for reading this, and I can not wait to unveil the final product soon. This is my first big undertaking, and I hope to deliver one of my proudest photoshoots to date. The Blog of a Crazed Photographer.